Choosing the best FPS mouse involves much more than simply choosing one that’s comfortable. If you’re just a casual gamer, you can probably get by fine with a regular office mouse. On the other hand, if you’re looking to take your gaming experience to the next level, a high-quality, well-built gaming mouse will undoubtedly go a long way in helping – especially when it comes to first-person shooters. When playing competitive online shooters like CS:GO, Overwatch, or Warface, you’ll likely find yourself at a deep disadvantage if you’re stuck with a run-of-the-mill mouse. Nearly everyone at this level takes his or her play serious enough to invest in good equipment. But truthfully, there are quite a lot of gaming mice available, making it hard to decipher the good from the bad. If you find yourself confused, fear not – this article will help you choose the best FPS mouse to match your particular needs. Here’s something most people find surprising when it comes to the ‘optical’ vs ‘laser’ debate: they’re the same – sort of. The primary differences are found in the type of technology used for illumination. A mouse’s CMOS sensor is usually optical regardless of the type of light used. The sensor works by taking thousands of pictures every second then comparing said pictures in order to infer how far and in which direction the mouse has moved. The real debate should be framed as ‘LED’ vs ‘Laser’ because, again, they’re both used by the optical sensor simply as a light source. Technically speaking, however, a laser can be classified as a special type of LED; nevertheless, that doesn’t negate the point. Most pros use ‘optical’ (‘LED’) because they usually work on a variety of surfaces. Also, ‘optical’ mice are less prone to inadvertent movements when the hand is in a hovering position, known in the community as ‘lift-off’. For example, this can occur when you reach the edge of your mouse pad and need to reposition the cursor. DPI or ‘dots-per-inch’ basically describe the sensitivity of your mouse’s movements. Although a high DPI count is usually a sign of a well-made sensor, in truth, most pros who play competitive FPS games have their DPIs set somewhere in the range of 800 to 1600 – a far cry from the 12,000 + most mice are capable of. Generally speaking, the type of surface you’re using has a greater influence over your mouse’s sensitivity than anything else. The same is true for e-sports players. In our community, a player’s grip tends to fall into one of the following categories: claw, fingertip, or palm. Knowing your grip type and finding a mouse that matches it determines how comfortable and accurate your gaming will be. Lastly, you should consider your budget as well as a list of required features. 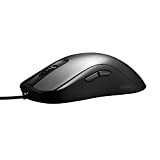 For example: Do you want the best FPS mouse under $50? Do you want a flashy mouse with tons of RGB lights? 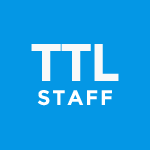 Do you need cutting-edge, well-tested software from which you can fine-tune your device? Would you like a heavy mouse or a light mouse? What type of sensor do you prefer? These are important questions you should answer before making your final decision. The M65 Pro from Corsair is the new and improved version of the original M65 that was widely loved by the gaming community. Engineered with FPS gamers in mind, the M65 is packed with a handy set of features that provide a more rewarding gaming experience. For example, the mouse’s ultra-sensitive 12,000 DPI sensor delivers unbelievably precise tracking. Furthermore, the sensor can be fine-tuned to provide the exact tracking the user finds desirable. The body of the M65 is crafted from highly-rugged yet lightweight Aircraft-grade aluminum. Nestled within the mouse is a customizable system of weights that can be adjusted to change the center of gravity. Several strategically placed buttons – including a dedicated sniper button – allow M65 owners to gain a competitive advantage with on-the-fly DPI switching and further customization options. And with the CUE software, owners have the ability to install their own macros and program the RGB lighting to their heart’s content. Lastly, the supremely durable Omron switches are rated for 20 million clicks meaning this mouse will hold up for quite a while. Razer – the California-based precision gaming products manufacturer – has been putting out quality mice for years now – and the DeathAdder Elite is no exception. Featuring an ultra-precise 16,000 DPI sensor, a tracking speed of 450 inches per second, and 99.4% resolution accuracy, this mouse is certainly good at adding to the death count in your favorite FPS. Any gamer with this mouse in their arsenal instantly gains the competitive edge over opponents. There’s a host of programmable buttons on this device. On the left-hand side, there’s a pair of incurved ’deep action’ buttons that match the mouse’s contour. While it may not seem like a huge deal on the surface, we’ve found the curve perfectly matches the resting position of our thumbs and affords easy access to both buttons without strain. Directly behind the scroll wheel is another pair of much smaller programmable buttons. Some users feel that because of their location, they aren’t very useful action buttons, however, they’ll work fine for profile switching and DPI sensitivity adjustments. The main buttons are triggered by high-quality Omron switches, which provide a very satisfying click when engaged. All in all, considering the price and feature set, there are very few mice that come close to competing with Razer’s DeathAdder Elite. 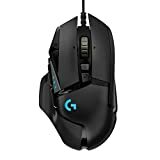 Logitech is well-known in the gaming industry as they produce a wide gamut of devices (mice, keyboards, headsets, and more). 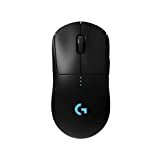 The G50 Hero is one of these products as it packs several incredible features such as 16,000 max DPI, 1 MS USB report rate, and a 32-bit ARM microprocessor. It is also designed to look rugged and high-tech and every inch of its surface was created with gaming and ease of use in mind. First, there is the HERO 16k sensor which allows for highly accurate tracking, it has 11 customizable buttons to personalize the experience as you need and comes with adjustable weights. Overall, the entire design is modular, created to allow users to imprint their own preferences. You also get the Logitech G HUB app that allows to change each button’s function and play with RGB colors and lighting animations. The mouse can remember up to 5 different profiles, so you can prepare for different situations. Finally, G502 Hero mouse is built to be durable, as attested by the braided cable, mechanical switches rated for 50 million clicks, and rubberized side grips. Do you play CS:GO? Regardless of your answer, you’ll want to check out BenQ’s Zowie FK1. This mouse has made a name for itself within the CS:GO community, however, it’s a great mouse for any FPS gamer looking for a simple, high-quality device. The Zowie FK1 was ‘designed for esports performance.’ You won’t find a fancy logo or a bunch of RGB lights, just a spectacularly manufactured mouse. At just over 3.1 ounces, the FK1 is on the lighter side, definitely a factor heavy-handed gamers should consider. The mouse uses cutting-edge Huano Switches and is designed to be ambidextrous – a rarity considering most top-notch mice cater to one demographic or the other. Within the FK1 is an Avago 3310, a high-quality sensor that pro players have loved for years. The company has designed the FK1 to be as flexible as possible when it comes to grip positions, however, palm and fingertip players tend to get the most out of this mouse. All in all, if you prefer simple and capable over flamboyant, the BenQ Zowie FK1 is for you. Click here to learn more about some other highly praised gaming mice. Ambidextrous. Responsibly priced. Excellently designed. What else is there to ask for? The SteelSeries Sensei 310 is probably one of the more overlooked mice to make our list. That’s rather unfortunate because SteelSeries has done a phenomenal job when it comes to the device’s overall aesthetics, capabilities, and software. Like the original Sensei that came before it, the 310 is ambidextrous. On both sides of the mouse is a pair of thumb buttons. Directly in the center, just behind the scroll wheel is a DPI adjuster. In total, there are 8 fully programmable buttons that you can customize via the mouse’s well-built software. Inside the mouse is a TrueMove3 optical sensor that offers 1-to-1 tracking at 350 IPS. The rugged mechanical switches deliver 50 million clicks without issue. All in all, the SteelSeries Sensei 310 is a great mouse for anyone looking to upgrade. Razer touts the Basilisk as “the next major innovation” in FPS gaming – and after getting your hand on one, you’ll see why. Priced just shy of $70 USD, the Basilisk is renowned for its highly ergonomic shape and lucrative feature set. Although the mouse is designed by Razer, it’s wholly unlike other mice on their roster such as the DeathAdder. Perhaps the most obvious aesthetic difference is the rather sizable rubberized thumb-rest that protrudes from the left side of the device. Also situated on the left, within the same thumb-rest area is a so-called “clutch”. Practically speaking, what Razer has decided to do is give the sniper button a facelift. Just as with a traditional sniper button, the Basilisk’s clutch lowers the DPI to facilitate more accurate shooting. It’s also worth noting the clutch can be re-programmed to carry out other tasks, depending on your needs. The Basilisk is without a doubt a very formidable FPS gaming mouse. It features a 16,000 DPI PWM3389 sensor, ‘gaming-optimized’ mechanical switches rated for 50 million clicks, and affords near boundless customization. TechRadar recently crowned the Rival 600 from SteelSeries the “heavyweight champion of FPS gaming mice” and we couldn’t agree more. As far as aesthetics, the 600 looks like the more handsome older brother to the 310. But with all due respect, the 310 is billed as an entry-level device whereas the 600 is for pros and high-level amateurs. When it comes to performance, SteelSeries’ Rival 600 features an industry-leading TrueMove3+ sensor – the same that’s found in the 310, however, there’s also a secondary sensor that halts the cursor from moving when the mouse is lifted. Such a feature results in remarkably more accurate gameplay. The 600 offers a max CPI (counts-per-inch) of 12,000. Online gamers are always looking for ways to gain an edge over their opponents. In the intro we told you that everyone at this level takes their craft serious by purchasing top-notch mice, however, the Roccat Kone AIMO is in a league of its own. Packed to the brim with features and customizable options, the Kone AIMO is every gamers dream mouse. Each device features a number of programmable buttons, cutting-edge RGB technology, and an ultra-precise Owl-Eye Optical sensor that maxes out at 12,000 DPI. Perhaps the most innovative feature of all is the “Easy-shift Technology” that allows you to double the number of customizable buttons. Fittingly, all that’s required is – you guessed it – the press of a button. Roccat Studios has been at the forefront of gaming mouse innovation for well over a decade and the Kone AIMO is no exception. When you lunge into battle, you want to have the best tools and weapons by your side. 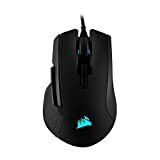 Well, when it comes to virtual battles, the IronClaw mouse from Corsair is one of the best tools and weapons to grip tight! With slim and elegant lines, the mouse is shaped to fit any hand (especially large ones) and works best for palm grip (the most popular among players). Moreover, the IronClaw is lightweight (105g) and moves smoothly on any surface. In terms of performance, the mouse packs a highly advanced optical sensor that allows for native 18,000 DPI that can be adjusted in steps of 1 DPI. This helps with those situations when you need high sensitivity from your mouse to get the settings just right. It also has seven programmable buttons and two-zone RGB backlighting that allows players to fully customize the experience. The IronClaw is also well-built, with durable Omron switches rated to last for over 50 million clicks. The G Pro mouse was built in collaboration with professional E-sport gamers to create the perfect combination between design and technology. The result is a lightweight mouse that doesn’t distract the player with a weird-looking shape or lighting. The G Pro feels like it’s part of your hand and allows you to forget you’re even holding it, which is the ultimate experience a player could have. Since this is a wireless design, players get rid of cable drag and limitations and gain lightspeed wireless (1-millisecond report rate) connectivity that instantly translates their moves into the game. Moreover, the HERO 16k optical sensor provides accurate tracking and up to 16,000 DPI which makes the mouse extremely responsive without any lagging. The G Pro is incredibly lightweight for a gaming mouse (80 grams!) but also durable due to the unique endoskeleton design. It’s also ambidextrous and has four removable side buttons so players can customize it as needed. We have reviewed the top FPI mice for you so that you can make the best decision on what to get. Paired with a great gaming monitor and gaming keyboard, you’re on your way to being the champion. Once you know what you want to get out of your FPS mouse, you’ll be able to pick the best one to help you get the most out of your computer gaming experience.